First class meeting is January 24, 2003 at 3 pm in PSH456. In four weekend field excursions, students will gain field experience with a variety of environmental and applied mapping problems. We will be joined on the trips by several US Geological Survey, Arizona Geological Survey, and Northern Arizona University colleauges to enrich the projects and mapping pedagogy. Emphasis is on geological mapping and careful observation in the field. Field maps and notebooks will be turned in at the end of each field excursion. These will be graded and returned. A short writeup on the relevant analyses (landslide geometry, folds and faults, earthquake hazard, and subsidence hazard) will be due within two weeks of the field trip. There will be one class meeting at the beginning of the semester, and then a several hour meeting before each trip to discuss logistics and the key elements of the mapping problem and follow-up analysis. Investigation of an active landslide adjacent to Highway 17 in the area of Black Canyon City. Evaluation of the geometry and activity of this landslide is an area of interest for both the Arizona Department of Transportation and the Arizona Geological Survey (AZGS). We have mapped this slide and monitored its movement over the last 4 years. In this trip, we will employ GPS systems to document features with greater precision and will compile the mapping in a GIS. The map area will be divided and students will have responsibilities for a portion. Mapping will be compiled and a multi-authored publication will be prepared for the AZGS. Detailed mapping of geologic structures in the Painted Canyon area of the Mecca Hills. The Mecca Hills are comprised of deformed Neogene alluvial fan, lacustrine and Proterozoic basement units adjacent to the San Andreas Fault zone in the Salton Trough near Indio California. We will map the excellent exposures of the deformed rocks and evidence for recent deformation to build a structural model for the fault zone. Earthquake geology of the Lake Mary Fault Zone near Flagstaff Arizona. The Lake Mary Fault is the most hazardous potentially active fault in the Flagstaff area. Estimates of potential earthquake magnitudes along it are as large as M6. However, little is known about the earthquake history and recent slip history of this fault. In collaboration with Dr. David Brumbaugh of NAU, we will map the geomorphology of a portion of the fault zone and possibly study trench exposures across it to put together an improved understanding of the hazard it poses in Northern Arizona. Active karst features on the Southern Colorado Plateau in the Holbrook Basin, Arizona. 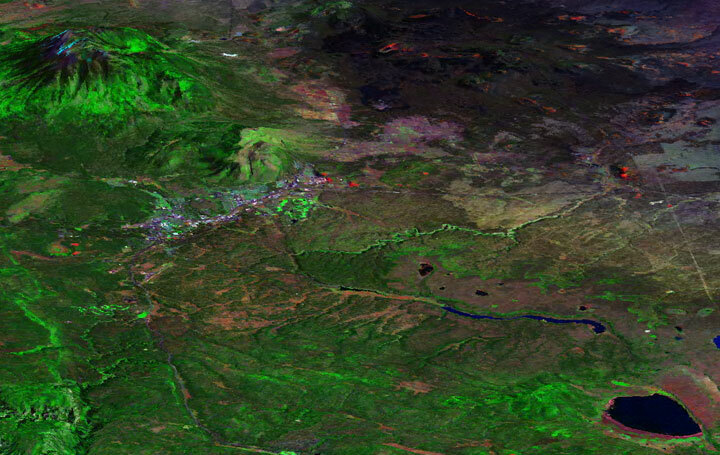 Active karst features are evident on the southern Colorado Plateau. What is the extent of these features? What localizes them where they are? How active have they been over yearly, decadal, centennial, and millenial time scales? What hazards do they pose to built structures in the region? These are the questions we will address with large scale mapping of landforms and geology.